How the domestic political fallout from the brutal murder of two Japanese nationals could upend Abe’s foreign policy. Prime Minister Shinzo Abe has been cast into a decidedly treacherous and unexpected foreign policy conundrum as of late: The Islamic State (IS) took two Japanese nationals hostage, and after making unrealistic demands executed both adventurer Haruna Yukawa and journalist Kenji Goto. Having originally demanded the release of Sajida Al Rishawi, a failed suicide bomber held in Jordan since 2005 for Goto, this week they released video of the Jordanian pilot being burned alive. The Jordanian king met with officials in Washington immediately and announced the execution of Al Rishawi in retaliation, while Japan remained on the sidelines. But a further victim might be Japan’s most aggressive effort to engage on foreign policy issues in years. 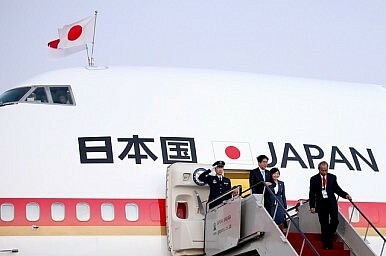 Abe has been the most foreign policy-focused prime minister Japan has had for a very long time, with a record-setting itinerary of international travel. This hostage crisis has not only underscored Japan’s inability to force change on the ground when it really matters, but also might well compel Abe to spend less time engaging with the world and more time shoring up his power back at home. Rather than seeing Japan as the pacifist, humanitarian-focused nation Abe has tried to present throughout his time in the region, IS simply cast Japan into the same camp as the U.S. and its allies. At some level, Tokyo must be shocked. Japan has long sought to have a more neutral Middle Eastern policy detached from merely following America’s lead. But this doesn’t really matter since Japan ultimately lacked ties and leverage to the various Islamist factions within Syria when it counted, which is now. Abe’s condemnation of Yukawa’s execution and vows of vengeance for Goto have only allowed critics at home to bash his more muscular foreign policy. In retrospect, there is little Abe, or even the Japanese government, could have done. After all, whenever IS produces one of these macabre videos, it turns out poorly for its victims. In fact, many of the tropes of the previous murder videos appear in this production, such as the British-accented, knife-wielding masked militant, the hostages in orange jumpsuits, even the same English and Arabic typefaces in the credits and subtitles. Even the video’s high-quality production values suggest the same personnel who crafted the previous five grisly productions were responsible for taping these Japanese hostages. The fix was probably in from the start. Since the beginning of this crisis, the demand for $200 million for both Japanese hostages was astronomical and reflective of Abe’s humanitarian pledges timed for his visit to the Middle East. It also indicates IS engaging in a propaganda exercise, not a serious negotiation. By making this demand, however unrealistic, it gives IS an excuse to execute its hostages if and when the ransom is not paid. After all, recall that IS demanded 100 million euros right before murdering American journalist James Foley. Further, if it was money IS actually wanted, the protocol is to contact the victim’s family or government privately with a demand and begin negotiations, not splash their faces across the Internet. The hostages’ nationality is immaterial; IS has been reportedly collecting foreign hostages for some time for propaganda purposes. And it shows: If you watch the video carefully, the killer in black seems to be reading from cue cards, as if he’s a bit unsure of himself. Despite the title of the video being “A Message to the Government and People of Japan,” the man in black never actually says “Prime Minister Abe,” as if he didn’t know who he was actually trying to address. IS did not bother to translate this video into Japanese either, figuring English and Arabic were good enough to get their propaganda message across. The group’s very crude social media responses also indicated a lack of international sophistication towards Japan. So where does this leave Abe? With few options, sadly. Japan had few if any of the intelligence or military capabilities needed to rescue its citizens, even if that option was on the table. Japan’s response – compared to full-throated American outrage and call-to-arms – was extremely mild, including an apology from one of the hostages’ mothers for the “trouble caused” by her son’s capture. This ongoing crisis raises new political conundrums for Abe. His decision to return to Japan and coordinate through his newly created National Security Council further reinforced Tokyo’s determination not to give into terrorist demands. However, it’s also a sign of his vulnerability at home to his foreign policy efforts, which have paid few political dividends for him. International perceptions of Abe’s leadership in the wake of this crisis might lead some to believe Japan will chart a more globally engaged course going forward. However domestic realities within Japan seem to already be indicating an even more pacifist and withdrawn nation. Theoretically, Japan could have coughed up the money for its hostages, like other European countries have and Japan has done in the past. But even if IS had not changed its demands and even if Tokyo had wanted to hand over a palette of cash, that would have surely caused both a massive domestic and foreign backlash. And of course, IS can’t be seen as going soft on its demands while wanting to draw maximum attention to itself. So, it looks as if Abe, caught up in a conflict he had nothing really to do with, has been dealt a bad hand. And there was little Japan – a powerful nation with one of the largest economies in the world – could really do about it. And by stinging the prime minister in a way that hurts him politically and personally, this terrible tragedy might just have upended Japan’s foreign policy efforts for years to come. Aki Peritz is a former CIA counterterrorism analyst and coauthor of Find, Fix, Finish: Inside the Counterterrorism Campaigns that Killed bin Laden and Devastated Al Qaeda. Joshua W. Walker is a Transatlantic Fellow at the German Marshall Fund of the United States and a fellow at the Truman National Security Project. He previously served as a senior advisor to the U.S. Department of State. The views expressed are their own. Islamic State and Japan: What Next? Could Shinzo Abe seize the moment to raise awareness of Japan’s foreign policies and their impact on national security?